Melt 1 tablespoon Cinnamon Sugar Butter Spread in 3-quart saucepan over medium heat; add sliced almonds. Cook, stir constantly, until golden brown. Remove from pan; set aside. Melt 2 tablespoons Cinnamon Sugar Butter Spread in same pan over medium heat. Add rice; cook until rice has absorbed some of the Cinnamon Sugar Butter Spread (2 to 3 minutes). Add water; bring mixture to a boil over medium-high heat. Cook, uncovered, stirring occasionally, until rice is tender (18 to 20 minutes); drain. Return rice to saucepan. Stir in sweetened condensed milk, evaporated milk, whole milk and 2 tablespoons Cinnamon Sugar Butter Spread. Continue cooking over medium-high heat until mixture comes to a boil (8 to 10 minutes). Reduce heat to low; cook, stirring constantly, until mixture thickens (20 to 22 minutes). Add raisins and remaining 1 tablespoon Cinnamon Sugar Butter Spread; stir well. Spoon into serving bowl; sprinkle with candied almond. Serve warm or cold. This pudding is also great served cold. 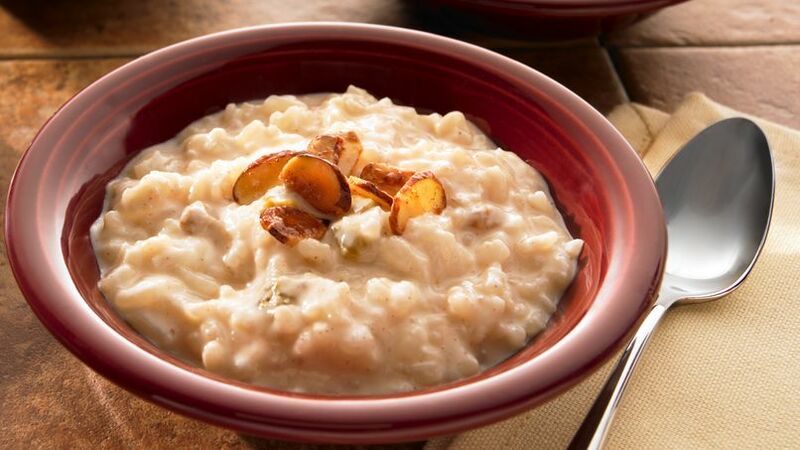 This classic rice pudding recipe is a take on arroz con leche (rice with milk) using three milks for a new twist.